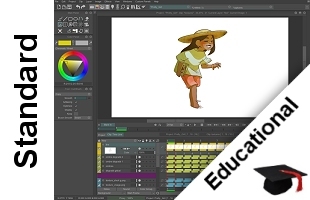 Diese Tutorials (in englischer Sprache) richten sich an TVPaint Animation Neulinge, die zum ersten Mal mit TVPaint arbeiten. - modify or delete a picture. For the moment we are not going to use a specific configuration. By the way, use the Reset Configuration button in order to follow this tutorial with the original configuration of the software. Once this operation is performed, click on the OK button. Unless otherwise specified, it is advised always to reset the configuration before starting a new tutorial. As soon as the software is loaded, you can immediately sketch into the drawing window using the stylus and graphic tablet. The result appears immediately, as if you were using a real drawing tools on a real paper. Just try it! In the example above, the user has drawn some mountains. If you need to erase the contents of the drawing window, you only need to click on the erase icon of the main panel. This icon looks like a small picture with a skull and bones (you can also use the shortcut key [Shift + K]). By default, you are drawing with the color located on the left box of the color picker. This color is called A Color. The color located on the right of the color picker is also called B Color. Those colors are visible on the bottom-left the main panel too. By default, the A Color is black. You can change it by moving the sliders located newt of it. Note that using the right mouse button on a color of a slider bar will bring immediately the slider to this color. If you want to change the B Color, you have to firstlyclick on it in the color picker. Then you only have to use one of the three discussed methods above. If you need to change the A Color again, you only have to select it again. A and B Colors are often needed: for example if you are creating a gradient of colors, or using animbrushes in luma color mode, etc... It is possible to swap them by using the [n] shortcut key or by using the encircled button on the picture below. This is very convenient for users that often use the same color. For example, you can keep the black color available in order to draw the outline of a painting. Here we are: you know how to choose your tool, how to erase a picture, etc... you are almost ready to begin your drawings! Here are a few useful notions to make you draw more easily. You can erase a piece of your picture, as if you were using a real eraser. In order to perform this, you have to select the Erase painting mode of your current tool ([F4] shortcut key). If you need to turn back into the classical Color mode, you can use the same pull-down menu or the [F2] shortcut key. You can adjust the radius, the power and the opacity of almost every tools, but that is not all: if you have a stylus with a tip and an eraser, you can assign a tool to each of them. For example, you can use the oil brush in Color mode with the tip of your stylus and the airbrush tool in Erase mode with the eraser. Since we have just finished to discuss the drawing basis, it's now time to try the various tools at your disposal. Now it is your turn to create TVPaint logos! 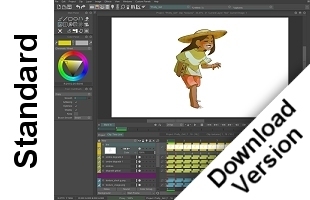 Feel free to use all the tools at your disposal and don't forget to share your results with the TVPaint Community!